Hamamatsu is also a historical city of importance, being the home to the first of the Tokagawa Shoguns. Although rebuilt the original main castle is still relatively original design and can be visited. Besides I have contact or two that a visit was customary. 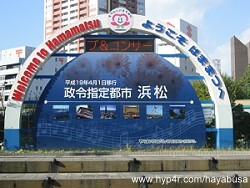 Getting to Hamamatsu is the easiest by Shinkensen or Bullet train. So that's exactly what I did. Just visit Tokyo central station and check the board on departure times and get a ticket! Try to pick the fastest Shinkensen - the Nozomi type if you can - it makes less stops. The trip took me about 1 hour 39 minutes. Also if you're lucky you may get the 300kph+ model which is a bit quicker. Unfortunately I got the 270kph model. 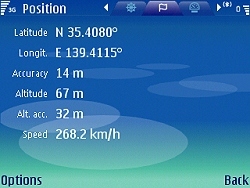 I have included the GPS reading just to prove it! A Shinkensen ride is something you must take at least once in your life. Sure, being on board may not be the most exciting place to be but knowing what speed you traveling at with a portable GPS adds to the event. It's one the fastest land based transport you'll experience. Once in Hamamatsu you'll be surprised at the climate change and of the surrounds. The city is clearly in the grip of re-defining its self. The recently updated main terminal is a contrast to the clearly industry based city. No big department stores except those around the station. Straight lines and wide roads are everywhere. It was the least busy station I had visited ever! Needless to say you are greeted with touchable displays from Suzuki cars and Yamaha pianos as you exit the station. Once out of the main station the large square greets you followed by Act City, the newest and largest building in the city. You can also see the fountain welcoming you to the Music City. Primarily because Yamaha, Kawai and Roland makes parts of its instruments there. There are quite a few music festivals and meeting held in the city as the visitors guide tells. You must visit the look out at the top of the Act City building because it gives you an amazing view of the city and coast. There's even a capel up there so you can have a wedding too! They did have public tours of the Suzuki and Honda factories - but no longer. Yamaha tours according to the brochure where still available by appointment. So I didn't get to check out the factory. Whether my new Hayabusa was made on that day who knows. As for other tourist sites checkout the Official website for pointers. I didn't have enough time to see them as I had other appointments planned for the day. Exploring the city was a tad strange since there where very few people about. And most where older citizens wondering about. There are very few tourist type shops outside the main train station. What was stranger was that the city does not have or promote walking across roads. Instead they have built underground walkways - interesting isn't it. Most underpass crossings had multiple exits so unless you have a really good sense of direction you will end up on the wrong side of the street. I wasn't the only one to have directional issues. I took a walk to the Hamamatsu castle about 4km walk and found the gardens round the castle. I recommend a visit not just for the castle but for one of the most beautiful Japanese gardens I've visited. The experience is hard to describe. The garden was not pruned to perfection like temple gardens or had too much open space as per the current Imperial palace in Tokyo - it just worked for me. Although you can get the bus or train I choose not to - because I get to see the places I'd miss and experience what it would be like to actually live in the city. For example going to Kawagoe I got to wonder around the back streets and see where people actually live. So as the sun was setting it was back to Tokyo for further adventures in its busy streets and of course the night life. Tomorrow I planned a full day in the city checking out some major attractions.